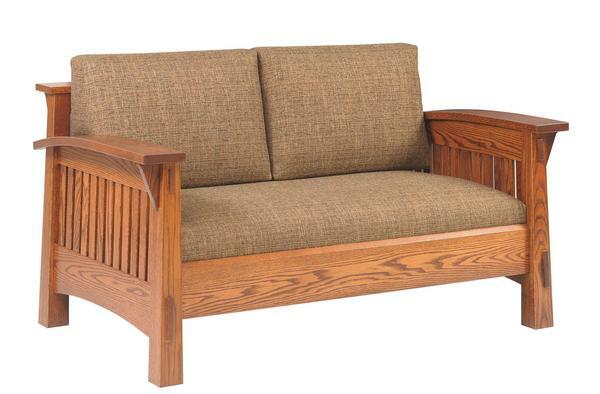 Our Amish Country Mission Love Seat is made with high quality hardwood, and the best upholstery. By combining solid wood with soft fabric and foam, our Amish woodworkers form not only a visually appealing product, but one that is sturdy, safe and reliable as well. When paired with an Amish Country Mission Sofa and an Amish Country Mission Chair or two, this love seat can be a product of a room for the whole family. Perfect for family gatherings, coffee with friends, or relaxing with the kids after a long day of work, this love seat sits a couple of people comfortably. Personalize this Amish Country Mission Love Seat with a fabric of your choice. Whether it be a bright, vibrant, flowing design, or a more simple pattern with a darker color, we try to supply a fabric that fits your taste to the best of our ability. Customize not only the fabric, but the wood and finish as well. All of our solid wood is sturdy and durable, and our fabric is soft and resistant. Ask one of our furniture specialists about the variety of available finishes and fabrics.